TecRec Technical Courses Cyprus, Technical diving is scuba diving’s ‘extreme’ sport, taking experienced and qualified divers far deeper than in mainstream recreational diving. Technical diving is marked by significantly more equipment and training requirements to manage the additional hazard this type of diving entails. Tec diving isn’t for everyone, but for those who hear its challenge call, the PADI TecRec courses are the answer. 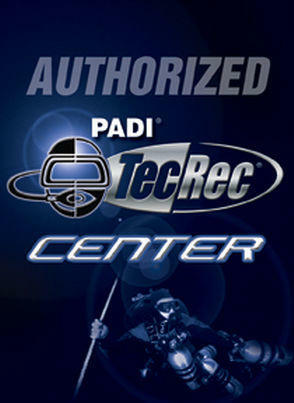 PADI TecRec courses are the most instructionally coherent and demanding tech diving programs available. They’re not easy – nor would you want them to be for this kind of diving. TecRec courses are integrated into an instructionally valid, seamless course flow that takes you from beginning tech diver to one qualified to the outer reaches of sport diving using synthetic gas mixes. You can complete the basic level, Tec Deep Diver, as a single course, or divided into two or three courses, for learning efficiency, instructional integrity and schedule flexibility. Technical diving uses more scuba gear than recreational scuba diving. Technical diving uses much more equipment than recreational diving. The technical scuba gear typically uses two to four or five regulators, a dive computer, som accessories and most likely a dive light. The PADI Tec 40 diver is qualified to make decompression dives with not more than 10 minutes of total decompression and not deeper than 40 metres while using a single cylinder of decompression gas with up to 50 percent oxygen (EANx50) to add conservatism to the required decompression. 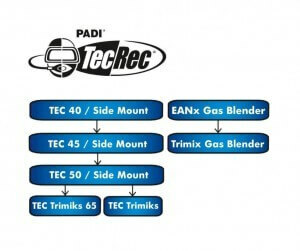 The PADI Tec 45 Diver Course provides a transitional qualification while you continue to develop as a Technical Diver. As a Tec 45 Diver, you are expected to have met all the requirements for Tec 40 before starting this course. PADI Tec 40 Diver certification. PADI Advanced Open Water( or hold a qualifying certification from another agency). 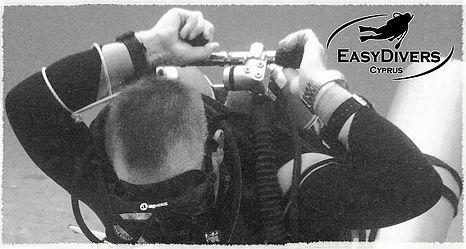 PADI Enriched Air diver (or hold a qualifying certification from another agency). 12 dives must be deeper than 18meters/60 ft.
Have a signed medical form your doctor. Make single and repetitive dives to a maximum depth of 45 meters/145 feet. Use a single decompression gas EANx, or oxygen, to accelerate or add conservation to the decompression. All PADI training materials related to this course. Willing to accept the added risks that technical diving presents. 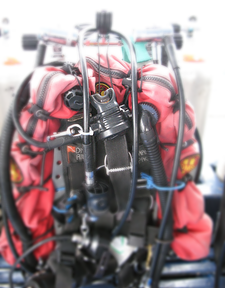 A Tec 50 Diver is qualified to use air, EANx and oxygen for multiple stop decompression dives as deep as 50 metres using standard open circuit, multiple cylinder tec diving equipment while using two decompression gases (EANx and/or oxygen) to accelerate or add conservatism to the decompression. Contact Us regarding more information about these courses.